The van tilted and shook as we continued along rocky mountain switchbacks. My fever broke but its aftermath left me dizzy and borderline comatose. 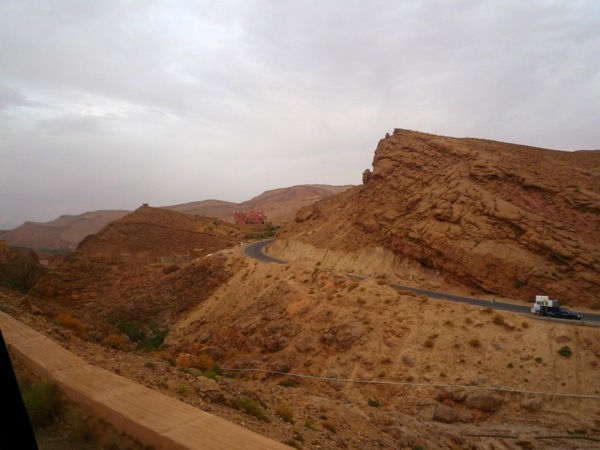 I regretted my decision to buckle into the van that morning but two hours outside of Marrakech there was no turning back. The night before my dorm mates from Copenhagen, Patricia and Cameil, carried me through the souk’s snarled labyrinth to our hostel. 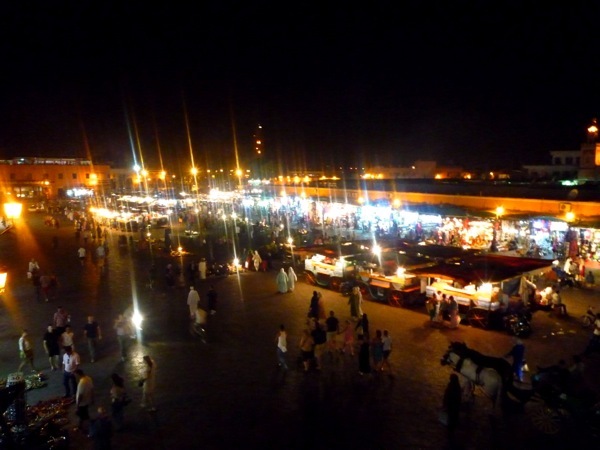 After a redeye train from Fez and no sleep I held my own navigating the market that day but found myself rapidly deteriorating over dinner. When I began to cry while discussing the plot line of The Kite Runner, I realized I had exceeded my limit. Surrounded by snake charmers, fire breathers, cross-dressing dancers, and unruly mopeds, it was difficult to discern what was reality and what was my own fever induced hallucination. 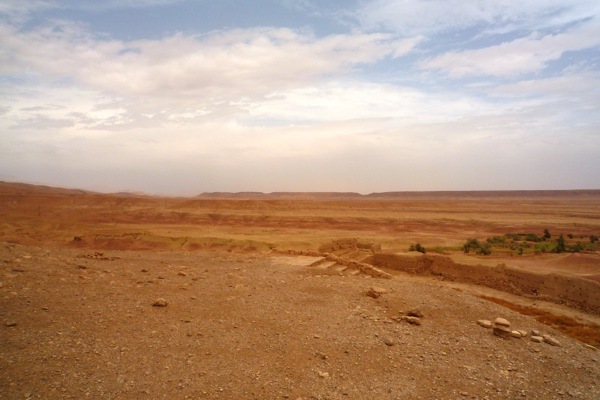 In the morning, with a stomach weaker than generic brand toilet paper, I questioned whether I should take the three day desert tour I had scheduled. Romantic images of crossing deep golden powder dunes on the back of a camel lured me to the desert while my illness begged me to burrow under the covers. Patricia, who had returned from the same tour days before, helped me pack. So there I was. 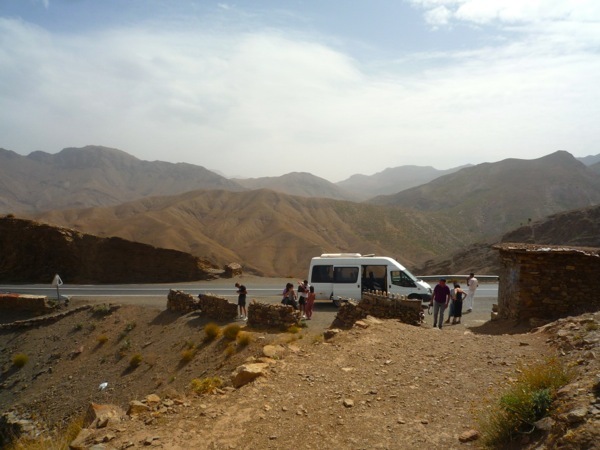 Nauseous in a van snaking up the Atlas Mountains en route to the Sahara desert. Wind swept the dry terracotta hillside billowing dust in clouds around us. Small villages built into rock sat like sea snails encapsulated in nooks on coral reef. 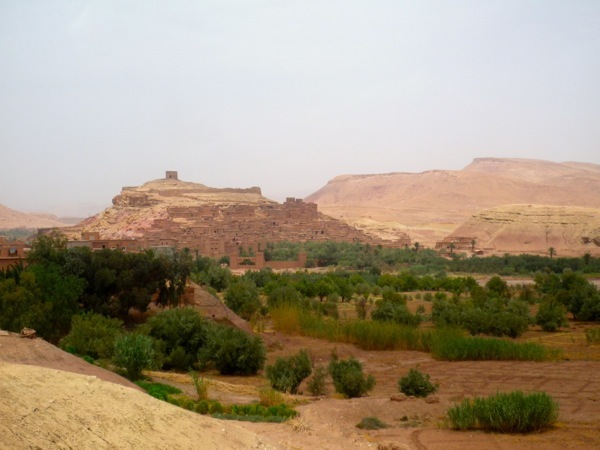 Green land lay in patches below the cliffs appearing as intermittent oases. Small stores came every hundred miles selling heaps of malachite, geodes, and crystal wands piled and unsorted like discarded clothing at a Goodwill outlet store. We pulled over at a rest stop and I bought a coca cola, which growing up my mother administered as medicine rather than a suitable beverage for consumption. “You must be American!” a voice shouted. I turned around and a forty-something blonde Ken doll with a smile plastered across his face came towards me. “I can tell because you don’t have an accent,” he confirmed. “I have an American accent,” I responded cheekily. The Ken doll, who resided in Wisconsin, spent the next few hours revealing lesser-known toxic foods in my diet, outlining his upcoming travels in Europe, and educating me on TRX Suspension training. He had video of himself using suspension cables for exercises all over Morocco, including in the souks in Fez, and had big plans to suspend the cables from the harness of a camel once we entered the desert. I hesitatingly agreed to film it. His travel partner was a shy engineer from South Korea. The two met in Fez and appeared an unlikely pair. The other passengers included a Spanish woman volunteering at the women’s cooperative in Marrakech, three friends on holiday from Valencia, an adventurous British family, two women from Amsterdam, and a well traveled engaged Venetian couple. We stopped for lunch and I immediately lay on the firmly stuffed satin covered cushions that surrounded the perimeter of the square open restaurant. The various groups stuck together and I became adopted by Ken and the Korean. Ken worked in the states with famous athletes as what he called “a witch doctor”. He analyzed my ailments and began finding pressure points on the bottoms of my bare feet to help relieve my nausea. I can only imagine how this appeared to the Moroccan waitstaff who dressed and behaved professionally while I lay propped on pillows barefoot at the table and an older man tended to my feet. The mother from our group’s token British family, a practicing acupuncturist, came to help. She took a pit from a honey soaked date the American had just consumed and macgyvered it into an acupressure wristband. Back in the van I kept the date nestled in the new crevice formed in my skin, desperate to try anything that might alleviate my symptoms. 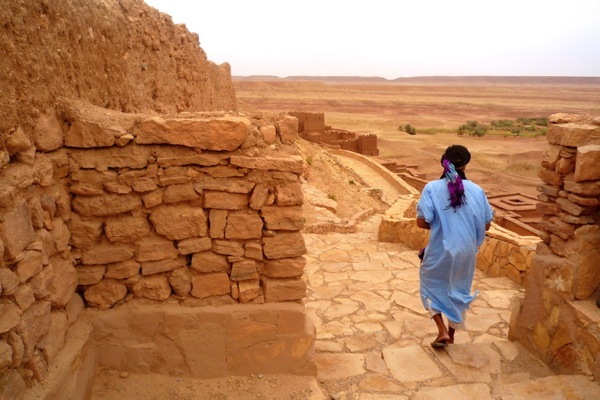 We stopped at the ancient village of Ait Benahddou where blockbusters like Gladiator, the Mummy, and Lawrence of Arabia were filmed. I walked like a sorority freshman recovering from her first hangover into the clay city walls. 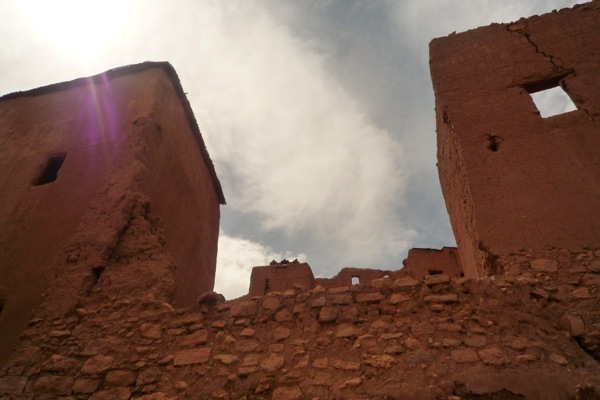 The well-preserved pre-Saharan ksar towered above us maintaining many intricate details. We wandered the web-like structure where houses clung together like wild ivy offering protection and strength from outside threats. 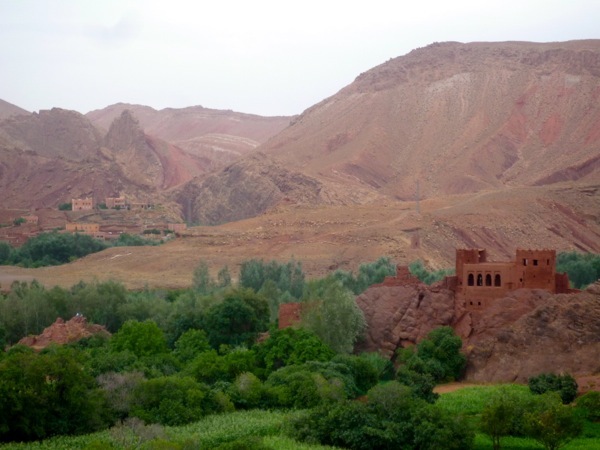 The few Berber families still residing inside the clay walls dodged the insensitive camera lenses of tourists enthralled by their rustic novelty. Vendors sold traditional paintings, textiles, and geodes. We watched a painter create contrast in his desert watercolor by burning it with a small flame, then use indigo and saffron to colorize the image. At the top of the structure overlooking the surrounding hillside, the wind blew furiously, whipping my desert dry curls across my face. As we exited I stopped to examine a crystal displayed outside the window of a shop. The clerk began to haggle as I left to catch up with the group who trudged on half a mile ahead of me. I set down the rock and jogged to the bridge where the others were stopped taking photos. Geode in hand, he chased me down the dusty hill, shouting “Good price! Good price!” as the ground crumbled beneath him. 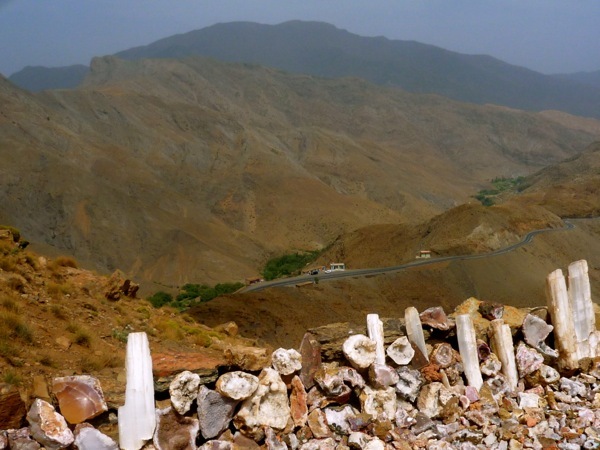 We continued our journey through the mountainous terrain occasionally stopping to photograph the stunning valleys below. Our hotel appeared in the distance, situated on the side of a cliff isolated from the rest of the world. Upon check in the receptionist seemed rather flustered to discover I was traveling alone. She showed me to my room with two twin beds, they had no singles, and called for some men to remove the extra bed. I sat alone in the empty white space. In the morning, the spinning stopped. That night I would watch the sun set behind Saharan sand dunes on the back of a camel. 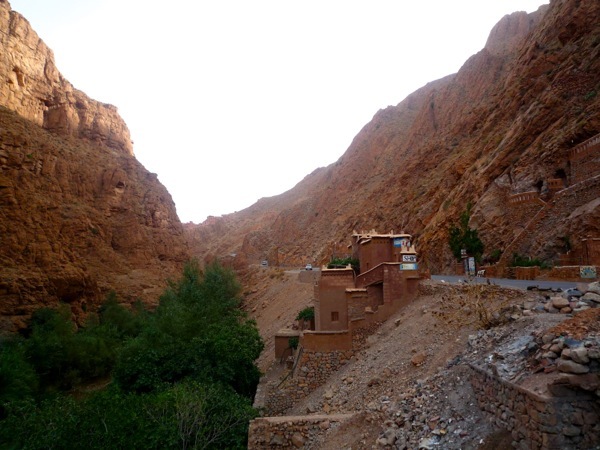 Marrakech is a solid place, but I think the High Atlas is pure Morocco. 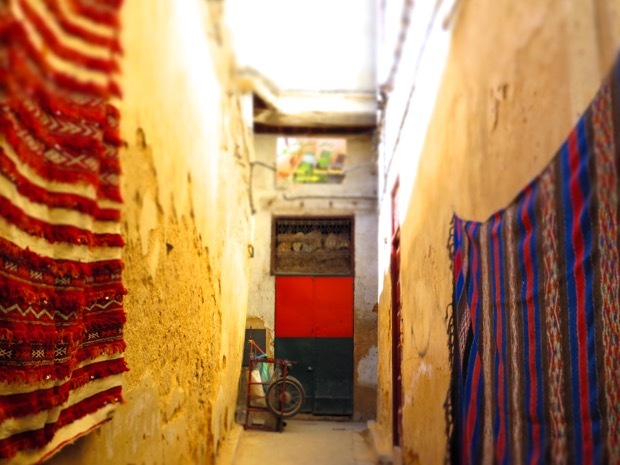 Ya I was pretty disappointed with Marrakech, I think it seemed so touristy after being in Fez which felt very authentic to me. I’ve really enjoyed reading about your time in Morocco so far. I do hope you pick up the story again! Thank you so much Willow. I will definitely pick it up soon I promise! 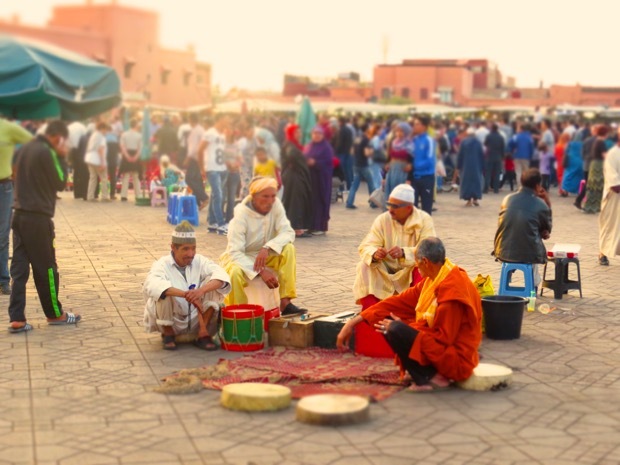 There is an amazing story coming up about my time in Essaouira. Can’t wait to share it.